Just because you make it to be the most powerful leader in the world doesn’t mean you end up rich. Some of our presidents didn’t really have it all together on the personal level. I wonder if that could be part of our national debt problem. We toured Monticello in 2005 and learned that Thomas Jefferson, one of my favorite presidents died a pauper. He was so poor that his Monticello (an estate of 5,000 acres and an architectural wonder of its time) was auctioned off. Even so his surviving daughter had to live off charity. This, even though he inherited 3,000 acres and several dozen slaves from his father! The plantation was purchased by Uriah Levy who started restoring it and showing it to visitors. His work was continued by his nephew, after a devastating return to a working farm during the civil war after the Confederate army seized it and sold it to someone else. It took long law suits to get the property back to James Monroe Levy after the war ended. In 1923 Levy sold it to the Thomas Jefferson Foundation of New York. Ulysses S. Grant also did poorly in personal finance. After his presidency, he and Mrs. Grant lived beyond their means touring the world. He ended up hundreds of thousands of dollars in debt and only salvaged his estate by selling (after his death) his civil war memoirs. We toured Gettysburg in 2005 as well and watched a re-enactment of the 4 day battle starting July 1 and ending July 4, where more than 51,000 soldiers from both sides died. Lincoln gave his famous Gettysburg address in this town and we saw the room where he slept the night before the famous speech was delivered. Lincoln was poor much of his life as well, losing everything in a joint venture on a store, but made a comeback with his income as a lawyer. Not all of the US presidents were bad at personal finance. In spite of his claims of struggling to pay off college debt, driving a car with a rusted out floor board and credit card debt that was ‘tough to pay off’ as presented on “President crashes personal finance party”, Barrack Obama and wife Michelle are worth millions – at least 2.8 million according to All the President’s Money: Where the Obama Invested in 2010. He earned 1.57 million in 2010 – most of this comes from royalties on his two books (Dreams from My Father, and Audacity of Hope). Of course, sales of his books, and hence his royalties most likely increased because he became president! George Washington; Lyndon Johnson (self made); both Roosevelts; Herbert Hoover (self made); Bill Clinton (self made after he was President) and John Kennedy were all multi-millionaires. 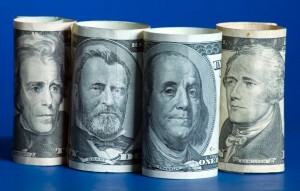 Read more about this on Yahoo Finance article The 10 Richest U.S. Presidents. Of course, there is that Presidential pension we now bestow on men (and hopefully someday women) who held the office. It matches current salary amounts of Executive Level 1 Personnel (like cabinet members), which according to a CRS Report for Congress was $191,300 as of 2008. Some argue that people who seek the presidency are, by nature, risk takers – explaining away the huge gains and losses suffered by some of our past presidents. Some of our presidents inherited wealth, others earned it before becoming president and others afterwards. So, what do you think? Does it make you just a little bit nervous to realize that some of the most powerful men in history flunked personal finance? Should proven financial acumen be part of the requirements to be a US president? Well, if they do decide to include that, I think it would be good for both parties. Having a leader with high financial knowledge can lead to having a beter budget allocation plan and less unnecessary expenses on the government’s part. I think it would be good for all of us and certainly some kind of requirement for anyone holding office. I actually had read that a handful of presidents had personal finance problems. But it probably does have something to do with taking risks and living “large,” though it’s no excuse for bad money management. I do want our elected officials to be familiar with risk taking – analyzing the risk, calculating the chances of it happening, understanding how to avoid the bad consequences or at least mitigate them. Someone who takes no risks would not be able to lead well in my opinion. I had no idea so many of the presidents struggled that much with person finance! Good point about presidents being natural risk-takers, that makes sense… although maybe that helps explain why our national debt is so large?? I’m biased on this, but I think our national debt is so large because we have moved away from our democratic roots and are well on the way to being a socialist nation – funding too many entitlement programs.